Summer 2014 marked Sound Impact’s inaugural international tour to Costa Rica. 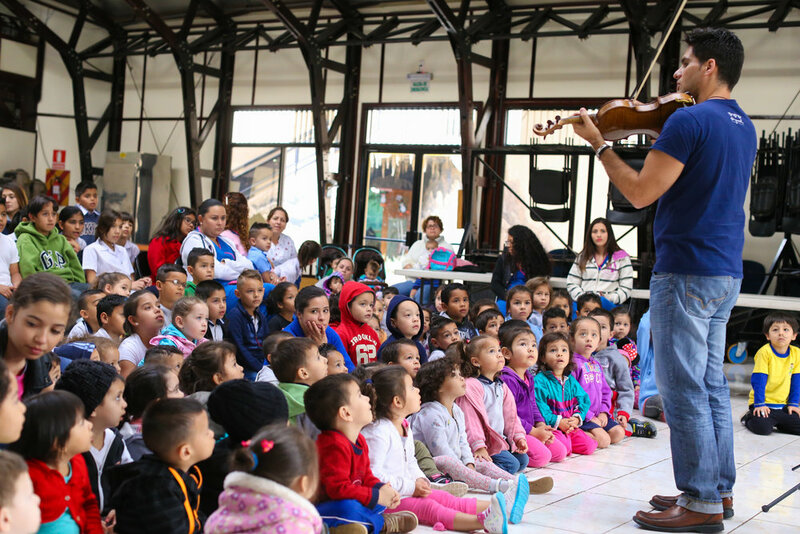 Costa Rica is home of the SINEM program, a government supported after-school music program, providing thousands of children of all socio-economic backgrounds the gift of music education. Although SINEM is government-funded, there is still scarcity of music, instruments, proper supplies, and teacher training. It is common to hear about brass and wind players learning to teach violin and cello (by watching YouTube videos) because there are no string teachers. Each tour Sound Impact has provided hundreds of Costa Rican children with free lessons, donations of musical accessories and instruments, and a performance for the community. Thanks to a grant by the Foundation for the Advancement of String Education (FASE), Sound Impact will offer teacher training workshops for the teachers based on the Bornoff Method, made possible by FASE. The 3rd annual Sound Impact concerts featured four Costa Rican premieres and also a world premiere today's award winning composers. Each tour Sound Impact has performed new works by composer and principal clarinet of the San Francisco Opera Orchestra, Jose Gonzalez Granero, and this year is no exception. The other Costa Rican premieres were works by famed composers Polina Nazaykinskaya, Dan Visconti, and Emmy Award-Winning John Wineglass. The world premiere was by Venezuelan Alex Rodriguez. Also featured was Rapsodia by Costa Rican native, Sergio Delgado Rodriguez, based on a folk song from Guanacaste. Each concert included a performance with students at each school alongside Sound Impact musicians. February 2018, Sound Impact returned to La Carpio in Costa Rica, one of the toughest neighborhoods stricken with poverty and crime. Sifais seeks to rebuild this shantytown through cultural growth, and Sound Impact and FASE, Inc. [The Foundation for the Advancement of String Education] will be presenting its first international teaching seminar to dozens of professors who traveled from different parts of the country to attend. Led by Debbie Lyle from FASE, teachers were introduced to the philosophy and teachings of George Bornoff. Teachers learned finger patterns, rhythmic and bowing variations, improvisation, repertoire, and large group teaching techniques. This course will be continued in July 2018. December 2014 Sound Impact performed its first outreach at a detention center. Read about that experience HERE. Since then, the outreach for this underserved population has blossomed into residencies and regular performances at juvenile halls across the U.S. including San Francisco, Santa Clara, Santa Cruz, Santa Fe, and Washington D.C. The following was written by an incarcerated youth during a poetry exercise while Sound Impact performed. that day that the D.A. wants to see. I wait to be set free. For the 2018 season, Sound Impact is Music at Kohl Mansion's resident ensemble for their 3rd through 5th graders music programs. Inspired by the belief that the arts strengthen communities, Music at Kohl Mansion, now in its 35th season, presents world-class chamber concerts in the historic Kohl Mansion and music education in public schools on the San Francisco Peninsula. Aligned with Kohl for Kids’ theme “Everyone Has a Voice” Sound Impact’s newest education program inspires self-esteem for even the youngest audience member. This engaging new program explores themes of embracing our differences and staying true to oneself through the story of Ben the Bear (music composed by composer D.J. Sparr, story written by Grammy award winning writer Barry Louis Polisar) and the timeless music from West Side Story (arranged by John Wineglass). This program features interactive games to deepen the experience and understanding of these string instruments and new sounds and textures of contemporary music brought to life by a string trio.